Although Theophilos's reign was one long series of defeats in military terms, it was a success in the areas of finance, administration, justice, and learning. In the East, the home of Theophilos's family, Amorion, was sacked by the Arabs in 838. In the West, half of Sicily had fallen by 841 and Arab incursions had extended as far as mainland Italy where Taranto fell in the same year. Perhaps in response to these failures Theophilos increased the wages of his soldiers and created three new themes and three kleisourai to bolster the defences of the empire. He also renovated the Constantinopolitan walls. Theophilos managed to fill the treasury without overtaxing the people, founded local mints that bolstered the economy, and invested in building projects such as an expansion of the Great Palace. He became famous as a defender and dispenser of justice, executing the surviving conspirators in the murder of Leo V, and reputedly walking through Constantinople encouraging the people to come to him with grievances. Theophilos was a more aggressive Iconoclast than his father. He actively persecuted Iconophiles, including two monks who had Iconoclast texts branded into their foreheads as punishment. He promoted scholarship, notably that of Leo the Mathematician, a mathematician and philosopher who was responsible for, amongst other things, a system of beacons to warn of Arab raids, and impressive automata that decorated the imperial palace. 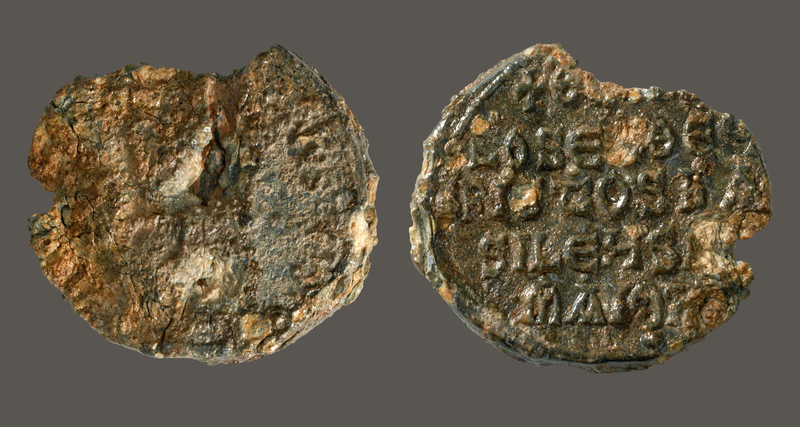 As with his father Michael II, Theophilos issued seals of two types. The first, from the period of his sole reign, 829 to 830/1, included a bust of the emperor wearing a loros, with a blank reverse. The second, as with other Iconoclast emperors, is aniconic. Zacos-Veglery dates this type to the entire reign, while DO Seals 6 argues, following Grierson, that the specific wording of the reverse inscription—“Theophilos, by grace of God, faithful emperor of the Romans”—is the same as the class 4 miliaresion, issued ca. 838–40, and therefore should date only to those years. The obverse shows a cross potent on steps surrounded by an inscription.